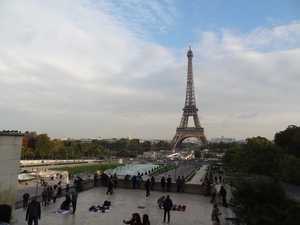 The forecourt of the Eiffel Tower is on the site of an old square which adjoined, in the nineteenth century, the Champs-de-Mars. 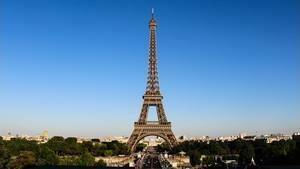 Nowadays the Eiffel Tower is on a large square tarred square square, measuring at least 125m side because it is the size of the square in which is placed the monument. And yes, there is 125m between the outer walls of the pillars, it was a condition for the construction of the tower. We are right next to the Seine, which is separated from it only from a wide avenue. On the other side of the bridge of Jena, it is the gardens of Trocadero, sloping, which rise slowly to the palace of Chaillot. That's north side. South side, it is the great extension of the Champs-de-Mars. Now public garden, it was the former military square for army maneuvers, whose military school overlooks the view south side. East and West side, there are beautiful gardens along the adjoining streets, lined with Haussmann buildings. So much for the general aspect of the neighborhood. There are several ways to get to the tower. You can arrive by the subway-RER C "Grenelle", in this case, we find ourselves along the avenue until arriving at the bridge of Jena. This way is not the way I prefer, because we see the tower at the last moment, when leaving the buildings. Another way is to cross the Champs-de-Mars, but here it is quite long. The preferred solution is to arrive by the Trocadero Palace, metro "Kléber" for those arriving by metro. We cross the slab and there, the view is beautiful. Then we go down the gardens before crossing the bridge and at any time we have the tower in his field of vision, it is closer and closer, until we arrive squarely on the forecourt. The forecourt of the Eiffel Tower is always lively, even late at night. It may be the second sensation of the visit, after the shock of his near vision, always very impressive. We are indeed in a very tourist area, attendance is essentially good child. Immediately the visitor is assaulted, calmly, of sellers on the sly. They sell small items related to the tower, postcards, miniature reproductions, plastic souvenir cameras, but also various toys, such as small helicopters flying to ten meters high, which is well seen this way. Do not get caught, these sellers do not have the right to sell you anything, and if you are still tempted, ask before you buy who benefits the money illegally acquired and recovered. In short, go your way. Once there, you will see the 4 pillars, all identical. They are covered with stones and are quite worked. They cover masonry walls that hide the heavy concrete blocks anchored in the ground - not too deep elsewhere. They all have a counter, but they do not all sell the same thing. In 2015, for example, the North Pillar was just a shop, tickets had to be bought at the East and West pillars. The South pillar, it allowed the purchase of tickets for the staircase. You will probably also be hit by the queue, especially if you arrive at a busy period: Summer all the time, on weekends. During the week, at the end of the afternoon, it is much more reasonable, for example, but it is not uncommon to see long tails from the wickets and meander for tens of meters, which is part of folklore, too. All around the square you will also find official shops, often in the form of sellers in kiosks, and some sellers of curiosities: Here, you will be offered a bike-taxi ride, there 20 minutes driving a Lamborghini etc. 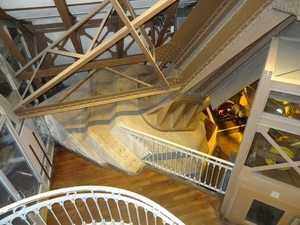 During the discovery of the north pillar rendezvous, there is a bust of Gustave Eiffel placed on a pedestal high enough. It's the very least of anything to have dedicated such a bust here. It is golden and very well worked. Just behind there is the SETE office. For those who wonder what it is, know that it is the operating company of the Eiffel Tower, so the company in charge of making it live, to open to tourists, to ensure maintenance , painting, security, etc. Of course these are only extra rooms. 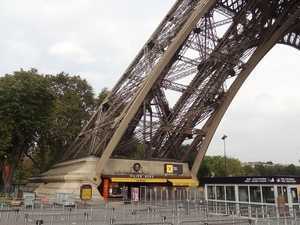 The forecourt also has various security features: Metal detector portals, under which you are obliged to pass before entering a pillar, kiosks selling tickets, placed next to the pillars for work, the entrance of the restaurant "Le Jules Verne", on the 2nd floor, which has a private access to the tower and in front of which is the map. It's a gourmet restaurant. Like all visitors you will not be able to do anything but put yourself in the center of the square, below the hole of the 1st floor. Here, the view is vertical on the floor of the 2nd, more than 120m high, but what is more interesting is the view of the windows protection that were put in place in 2011 as a railing . 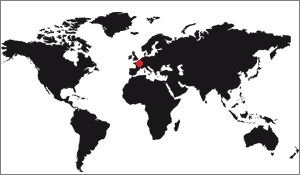 We see them well, and above, we see the 3 red, modern pavilions. You should know that one of the three, in which there are toilets, allows you to use the sinks being leaning forward, the view then plunging where you are, 60m lower! A last note, of a practical nature: Beware of pickpockets! Public pillar, but not very accessible. Rest the East and West pillars, both equipped with elevators rising to the 2nd floor. Once past the controls and verification of the ticket (via a turnstile all that is classic, plus a human control) the view opens to a room larger than one would think from outside . This is the room in which the elevator arrives, so there are removable glass doors in front of the visitors. The rest of the room is rather classic stone, with a high ceiling. We see the departure of the crossbowman, the piece forming the angle of the pillar, and its junction with the solid mass (the concrete block taken from the ground). There is also a perforated metal staircase that goes up to a kind of mezzanine where there is another pair of removable doors: This is because the lifts are double cabins, there are visitors up and down. However only one level is used, if there is no affluence. We also see very well the technical installations through the windows. 3 big tanks go up and down alternately with the race of the lifts, it's normal, they act as a counterweight. We also see, through an open door, the machines operating the cables. Especially in each of the two pillars there is a machine of the old times, on display. A sign above indicates that this is one of the tower's original machines in 1899. So there is not much to see in the pillars, but we must emphasize the efforts that have been made to stage a room that is ultimately only an elevator shaft. The forecourt of the Eiffel Tower is not specially equipped, there are no museum facilities, or special events that would attract crowds for a reason other than visiting the monument. But just walking around the place already gives the impression of being on the monument, it is probably due to the mass of metal that is above us at this time. There are essentially utilitarian kiosks, practical information, and access to the pillars where the interior is the premise of what you will discover on the tower itself, if you go up there. What is there to see on the forecourt?